This is a full-day performance driving course that will take you completely out of your comfort zone. 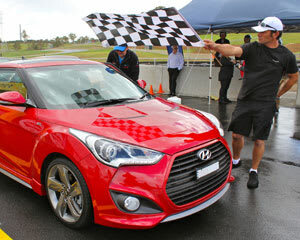 This is a full-day performance driving course in your own car that will take you completely out of your comfort zone. This performance driving course is not only rewarding, it will teach you about you and your motor vehicle in challenging driving environments. Ian and his team will coach you through 5 stages to refine your skills on wet and dry surfaces on a closed circuit environment, with in-car coaches accompanying you for parts of the day. Your course culminates in an extended drive on a challenging course with a straight, sweeping corner, zig-zag section and a series of corners that will put all of the skills that you have learned to the test! The day ends with a debrief and certificate presentation, served with afternoon tea. You will be trained by Ian Luff and his team of expert driving professionals. Motoring expert Ian Luff has been involved in post licence driver training since the early seventies. Ian is not only a qualified mechanical engineer, he is Australian motor racing champion (2004) and twice Bathurst 24 hour winner (2002, 2003). The 8-hour course commences at 8:00 AM. Great experience. Was totally impressed with instructors and set up . Fantastic . Had a excellent day with Ian luff and his team would highly recommend it. Was a informative plus a heap of laughs. More time behind the wheel would be an improvement. Brief moments of really excellent tuition and experience were interspersed with lots of "hurry up and wait". The day started with nearly an hour of waiting in a classroom set up.... Why did I bother arriving 5 minutes early I wonder.... I was expecting an order of service programme and some sad organ music by the time things got started. I think it would be possible to train customers to be ready for their turn so as to fit in more drive time throughout the day for example. ("You're next... grab your car and wait on the ready line") I'm trying to be constructive you understand. The in car training was excellent and much appreciated. Kind Regards, Ross. Fantastic day - I learnt a lot. Great experience in very wet weather conditions. Drive to Survive with Ian Luff was so good I would recommend it to everyone who drives a car and knows how to have fun!